Can Olympic skiing be made safer? 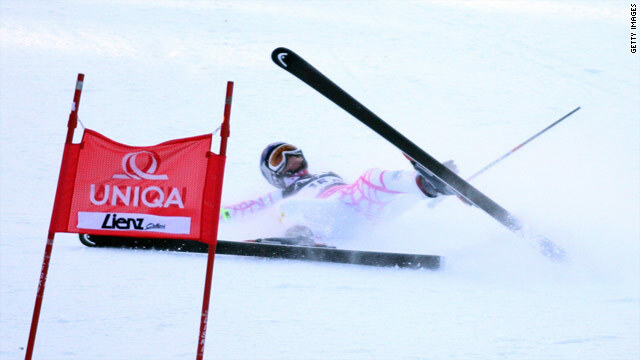 Lindsey Vonn crashes during the Audi FIS Alpine Ski World Cup Women's Giant Slalom in December. (Skiing Magazine) -- Picture this: You're charging down a course at 80 mph. The world whips by you in a blur. You catch an edge, smack into a gate and somersault into the safety nets, cracking your neck and shredding a knee. Season? Done. Olympic dreams? Over. Career? Definitely on hold, possibly kaput. That's what happened in December to TJ Lanning, one of the U.S. Ski Team's top racers, during a downhill race at Canada's Lake Louise. He's one of many international Alpine competitors sidelined this winter because of season-ending injuries. Other casualties include 2009 downhill champ Canadian John Kucera and French slalom star Jean-Baptiste Grange. Addressing the rash of early-season injuries, Aksel Lund Svindval, the 2009 men's overall World Cup winner, posted the following on his blog in December: "In two weeks of intense World Cup racing in North America, racers have sustained the following ... 7 torn ACLS, 4 knee ligaments, 1 broken arm, 1 broken leg, 1 broken neck, 1 concussion, 1 dislocated knee, 1 dislocated shoulder .. is this OK?" Sure, ski racing has always been a dangerous sport, but with ever-evolving gear and technologies creating faster and faster competitors, the incidence of injuries has spiked. The International Ski Federation (known as FIS), the World Cup governing body, launched the "Injury Surveillance System" in 2006 to track facts and figures on injury patterns across all disciplines: Nordic, freestyle and Alpine. Among Alpine racers, knee injuries are the most common affliction. As a part of this initiative, in December FIS convened a panel of six top Alpine competitors, including Didier Cuche, Scott Macartney, and Svindal, to drill down on how to make racing safer. They cited course preparation, improved take-off points for jumps, flat landings and medical procedures as top concerns. The athletes also made a plea for redesigned gates, ones that would rip off more easily upon impact. In Lanning's accident, they say this would have significantly reduced his injuries and their severity. While competitors want to increase safety, they're also aware that it's the danger, blood and guts of their sport that turn fans on, and athletes are wary of ratcheting down the visceral appeal. When it comes to modifying race procedures, FIS is adamant about using systematic data collection and scientific analysis to make informed decisions. In January, FIS rolled out a new, three-year scientific study to analyze Alpine racing safety and to make recommendations on how to decrease the number of injuries. The first phase will collect information through interviews with athletes, coaches and equipment providers, among other experts, to gather suggestions for short-term prevention solutions. Subsequent stages will focus on prevention strategies and rule changes. However, some modifications were deemed urgent enough to institute immediately: smaller jumps and new gates with flags that rip way upon contact. FIS works closely with the Vancouver Organizing Committee to design the Alpine courses at the Olympics, but ultimately, it's VANOC that sets them -- save the downhill, which FIS still oversees; it's an old, complicated tradition. With fog rising from Whistler Mountain during the downhill training runs, making visibility next to none, officials were scrambling to re-design the race gates in an effort to make them more visible, switching the flag color from green to red. With this last-minute change, officials on the ground weren't sure if the new, FIS-sanctioned gates would be in place during the Winter Games.